It is with a little sadness that I announce the passing of Nina, everybody's favorite brown anole. I say "a little" sadness, as opposed to great sadness, or unbearable sadness, because it's not like I have a ton of happy memories of running through flower-filled meadows with her or anything. (Though we did have that one moment in the bathtub.) You only get so much affection from an anole, and I don't think she ever got comfortable with seeing me, so our emotional connection was always a little fraught. Also it wasn't like I didn't see this coming, a long time ago. 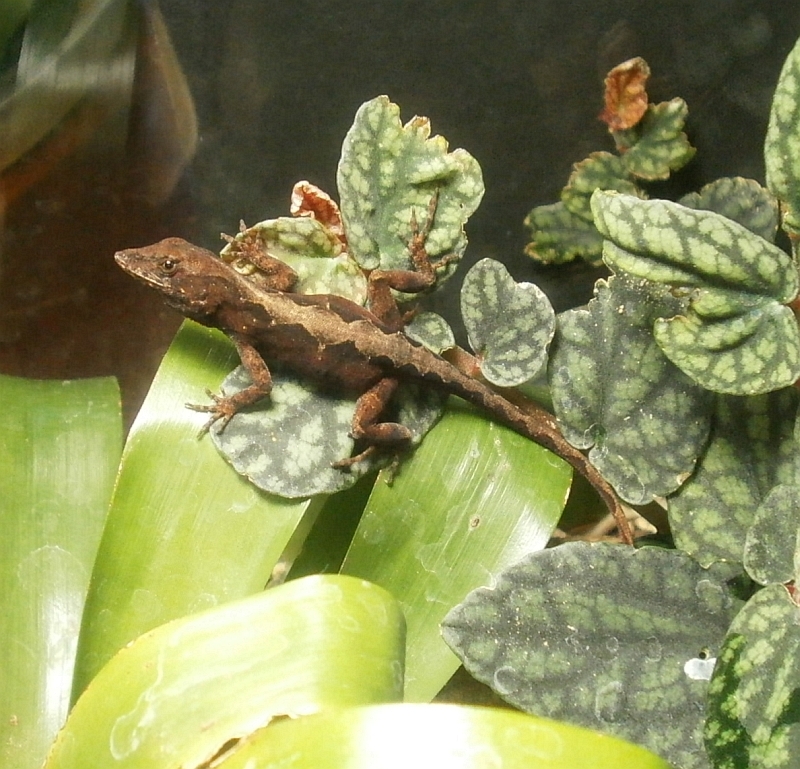 In the wild, allegedly, Anolis sagrei has a lifespan of about 1.5 years, and Nina was at least 4.3 years old when she died. I mean, her death is still a change and everything, but it's hard to see it as being particularly tragic if she was like 200 years old in anole years. Hopefully the time she spent here was better (if, perhaps, a bit less free) than she would have gotten had she stayed in Florida with Felipe. It was certainly better than it would have been had she stayed in the ex-job's greenhouse and been poisoned to death by pesticides, or if she'd escaped the greenhouse and then froze to death seven months later. Probably not going to get a replacement. (See above re: you only get so much affection.) I mean, I wouldn't necessarily have a problem with keeping another anole, but it wasn't like I had a burning desire to have one when I got Nina; she just kind of happened. So if the ex-job calls me up and asks me if I want another one, sure, but that's not something that's likely to happen. 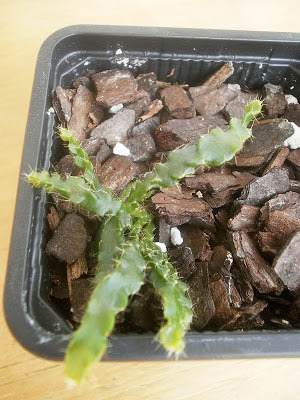 I have just over 100 Schlumbergera seedlings growing right now, and for the most part, they look just like their parents, except smaller. 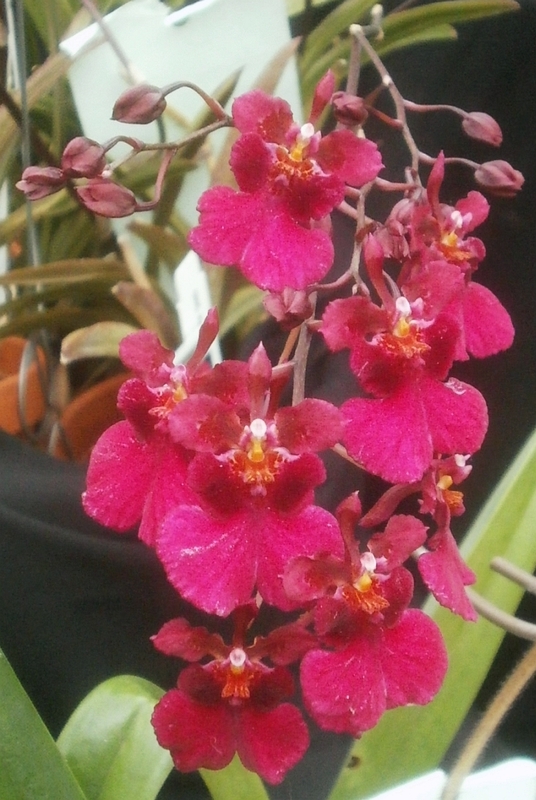 Also, most of those are seedlings from 'Caribbean Dancer,' which isn't really surprising, since 'Caribbean Dancer' is the most prolific bloomer. There is also a set of 16 seedlings from a NOID with salmon/peach blooms. A few of those are also normal-looking, but the majority are very slow-growing, and appear stunted somehow. A couple seedlings have a normal number of segments, but the segments are all tiny (1/4 the size of normal ones), or they're ridiculously overbranched (like, one segment with fifteen segments growing off of it), or there are only three segments and they're all long and thin. Stuff like that. #49,1 though, is the oddest of the odd. It seems to be growing, if very slowly, but the segments are long and narrow and sort of . . . I want to say "crimped," (?) along the edges. It seems weak, and I doubt that it's going to survive to blooming size, but I'm very curious about whether this is something it's going to grow out of at some point, or whether the flowers are going to be similarly malformed, or what. As a side note, if any U.S. readers are interested in starting their own small army of Schlumbergeras or Columnea orientandinas from seed, I have several ripe fruits of both2 that I need to do something with relatively soon, so send me an e-mail and I can probably mail you your very own seeds to germinate and be overwhelmed by. 1 (I'm not naming the Schlumbergeras like I have been with the Anthuriums; I probably ought to be, I suppose, but I'm not as emotionally invested in the Schlumbergeras. 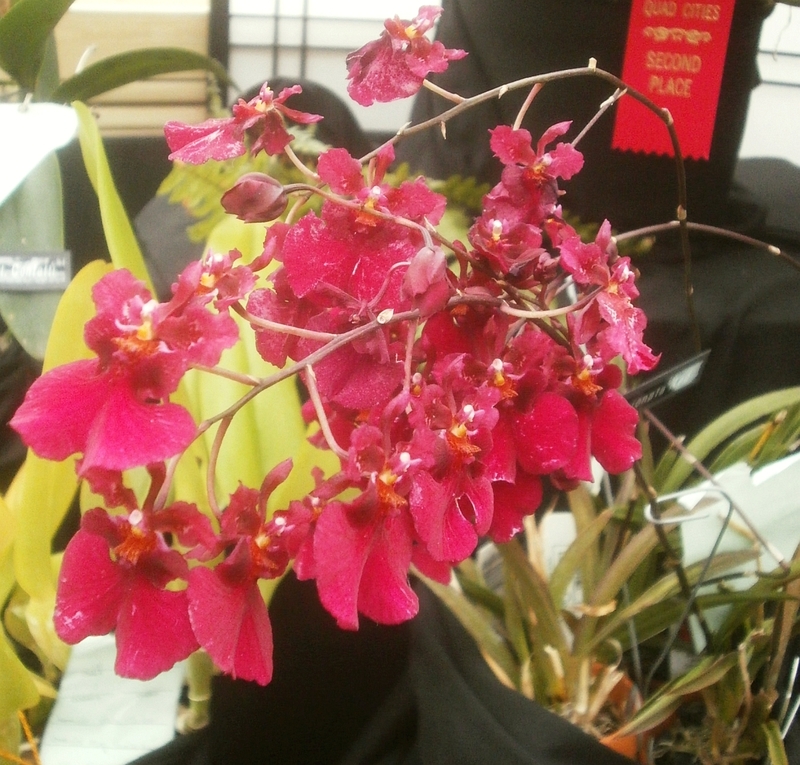 If this looks like an Oncidium, that's because it used to be: the genus Tolumnia was apparently separated from Oncidium about 25 years ago. They're native to the Caribbean. Tolumnia hybrids are a relatively new thing (last 50 years or so), according to the American Orchid Society, which also has lots of advice about how to grow them. Tolumnia Passionata Red is Tolumnia Florence Little x Tolumnia Breezy. I mentioned a while ago that I'd been seeing Cyperus for sale here and there, and had been tempted to get one. A number of commenters encouraged me to do so, and then a reader offered me cuttings of hers. I hadn't even known that growing them from cuttings was possible. Also, fortunately, it turned out that the reader who offered the cuttings had already written a blog post about how to proceed, so I didn't even have to search the net to get instructions. 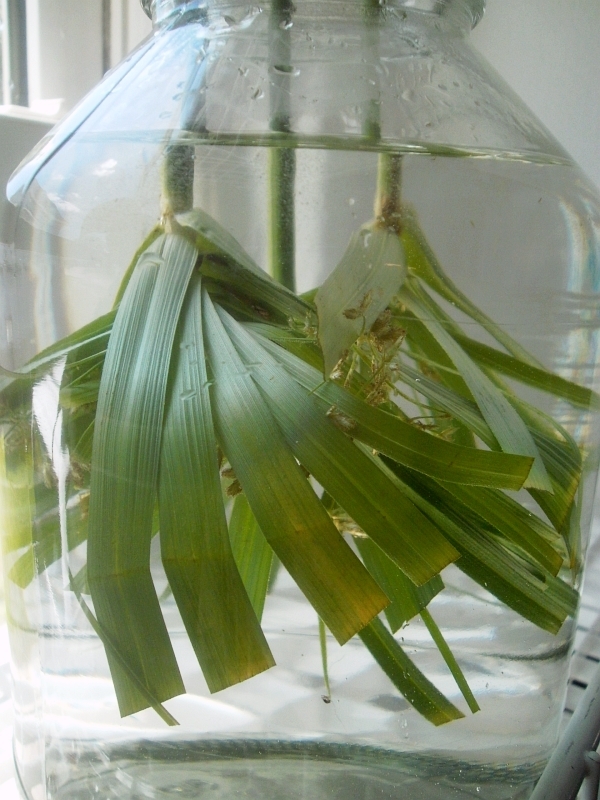 I goofed here: I should have taken a picture of the cuttings outside of the water, cut the stems, then taken a second picture of the cuttings in the water. Forgive me; I was excited. The cuttings are upside down, relative to the direction they were originally growing. The above picture was taken on 3 June. The jar then sat to the side of the kitchen window, where the cuttings got mostly bright indirect light with a little weak late afternoon sun. 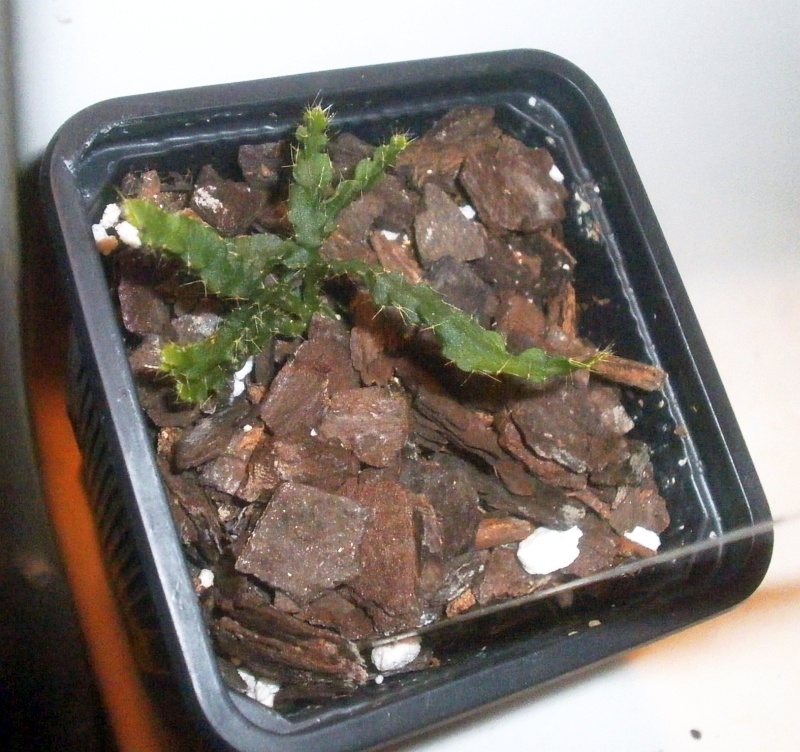 By 19 June, two of the three cuttings had produced new sprouts and roots from between the leaves. 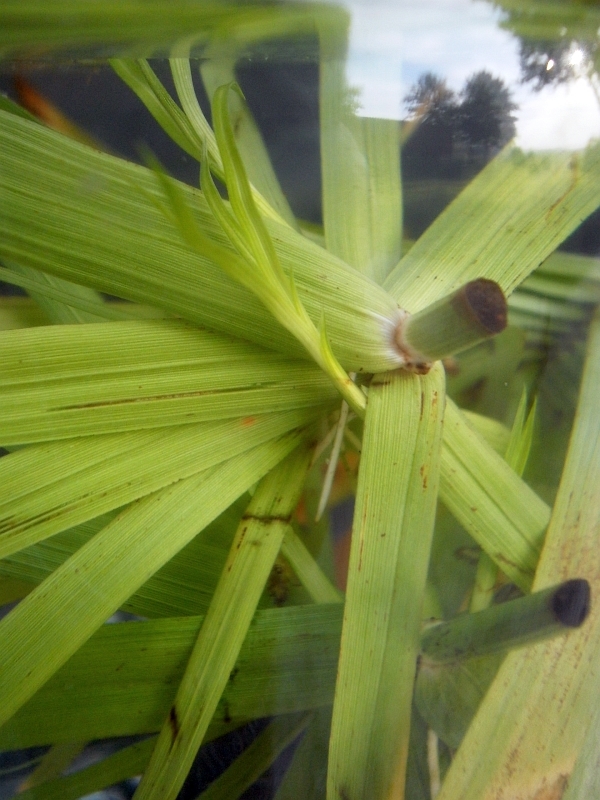 I then pulled them out of the water, cut off most of the leaves (I left about 3/8 inch / 1 cm on; it was impossible to cut very precisely without catching the new shoots and roots as well, and I figured it probably wouldn't matter if part of the leaves was still attached. ), and planted them in potting mix. Molly planted hers right side up, the direction they were growing to begin with, and I left mine upside down: it turns out not to make a difference. Growth has felt slower than I'd expected, especially considering how quickly the cuttings started to produce roots and growing tips. The whole process has actually moved pretty quickly, considering that I went from cuttings to plants in a month: I'm just impatient. This is what they looked like yesterday. Surprisingly easy so far; I've kept them in a saucer of water by the kitchen sink, so I remember to check to see if they need water. 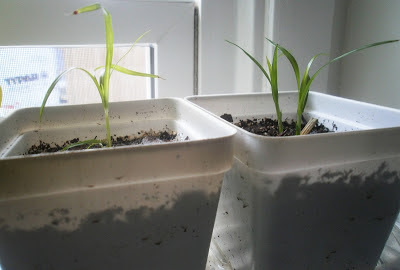 I expect that will become more challenging once their root systems expand a bit, but everything's worked fine with these two for the first month.